Quaint and charming, this farmhouse features all the necessities of modern living in a modest square footage. A trio of dormers and columns punctuating the front porch of this house plan grants a stylish exterior. A storage closet inside the garage creates the perfect place for lawnmowers, bikes and toys, while inside this house plan closet space is also abundant in the bedrooms and hallways. The master suite is designed to pamper with a walk-in closet and twin vanities, separate shower and tub. The bayed breakfast room of this house plan flows into the kitchen and great room, creating a seamless transition from one room to another. Accessing a spacious rear porch through French doors, the great room includes a fireplace and a cathedral ceiling that adds volume. 1st Floor: 1617 Sq. Ft. 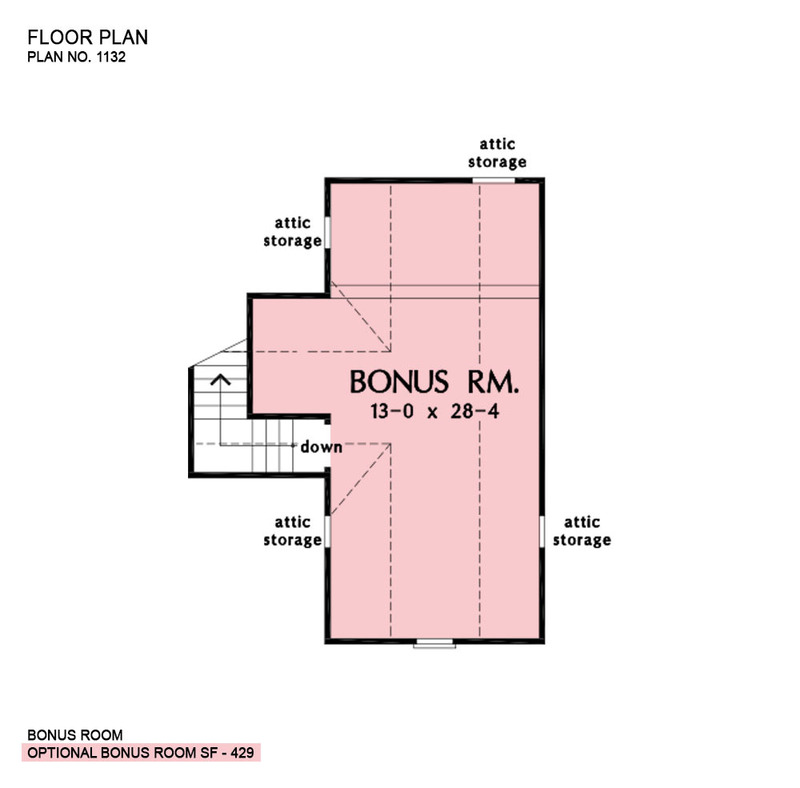 Bonus Room: 429 Sq. 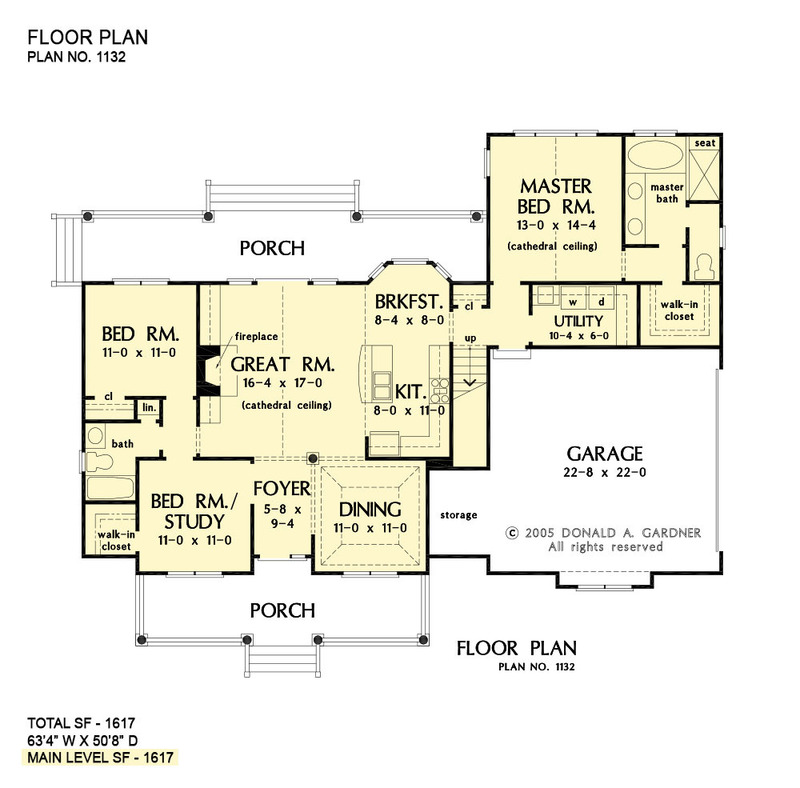 Ft.
House Dimensions: 63' 4" x 50' 8"
Master Bedroom: 13' 0" x 14' 4"
Porch - Rear : 40' 0" x 7' 0" x 9' 0"
Bedroom / Study : 11' 0" x 11' 0" x 9' 0"
Bonus Room : 13' 0" x 28' 4" x 9' 0"
Breakfast Room : 8' 4" x 8' 0" x 9' 0"
Dining Room (Tray): 11' 0" x 11' 0" x 11' 1"
Foyer : 5' 8" x 9' 4" x 9' 0"
Porch - Front : 29' 0" x 7' 0" x 9' 6"
Garage Storage : 6' 0" x 8' 4" x 0' 0"
Great Room (Cathedral): 16' 4" x 17' 0" x 17' 0"
Kitchen : 8' 0" x 11' 0" x 9' 0"
Master Bedroom (Cathedral): 13' 0" x 14' 4" x 13' 6"
Storage (Other) : 9' 0" x 1' 4" x 0' 0"